Mykonos, Delos, Rineia, and a group of uninhabited islets comprise a small archipelagos within the Cyclades islands. Mykonos is flat, with its highest point reaching 364 meters. The island covers an area of 75 square kilometers. The main rock is granite while the landscape is impressively devoid of trees, with just sparse coverage at specific areas-Panormos, Kalafatis, Ftelia-of low, thick bushes. Rineia (area 13 square kilometers, highest altitude 149 meters) is also flat and used for grazing as some areas are covered by phrygana; there are also a number of abandoned fields. Tragonisi (area 1.1 square kilometers, highest altitude 149 meters) is rugged and inaccessible with several sheer areas. The islet has mines and some flat stretches. Stapodia (area 0.5 square kilometers, highest altitude 133 meters) is rocky, with a number of cliffs, a few flat areas, and sparse ground cover of phrygana. 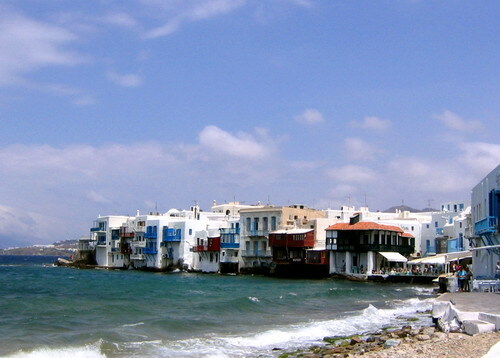 Mykonos has a generally dry climate with mild winters. 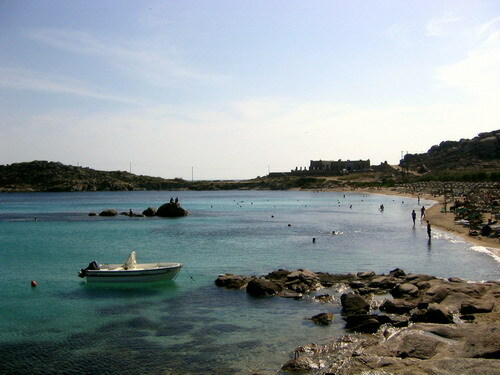 Typical of the island's weather are the strong northerly winds known as meltemia (singular=meltemi) and which blast over the island during the day in summer. Snow is rare, while there is no rainfall in summer and very little in winter. During the summer months, the sun is bright and very warm, thus visitors are warned to pack proper protection. Mykonos's barren landscape is actually far richer in fauna than would seem at first glance. The bald hills shelter many small creatures from the visitor's gaze. The island's signature fauna are the large, spiky lizards that sit atop rocks or dart among the dry stone fences. The crocodile owes its name to this lizard as when the Ionians arrived in Egypt they compared the crocodiles swimming in the Nile-and known until then as champsai, with the "Mykonos lizard" and finding them similar in appearance gave them the name of crocodile. Indeed, on the island, the lizard-or agama stelio-is known among locals today as a "land crocodile" or krokodilaki (little crocodile) or korkodeilas. According to an article by Achilleas Dimitropoulos for the Goulandris Natural History Museum, there are two habitats that are especially significant for the island's wildlife-the coastal wetlands at Panormos and Ftelia which are seasonally flooded and turn into small saltwater lagoons. Both are important resting stops on the routes of migratory birds. Within these wetlands there are a number of currents and drainages spots, such as the one formed at Marathi where a dam was built to create a new wetland. The sandbanks at Ano Meria are quite rich in silica. Mykonos's typically Cycladic terrain and climate-arid and dry-aren't conducive to traditional farming and only limited supplies of high quality cereals, wines, and vegetables are produced that are used to meet local consumption needs. Grains and vines were cultivated on the island since antiquity as attested by depictions of both on ancient coinage. Stockbreeding, which is limited today, produces the island's famed kopanisti - a sharp, creamy cheese - and xinotyra (sour cheeses). The island also produces a number of cold cuts, most famously louza and paides, both considered delicacies among gourmets. 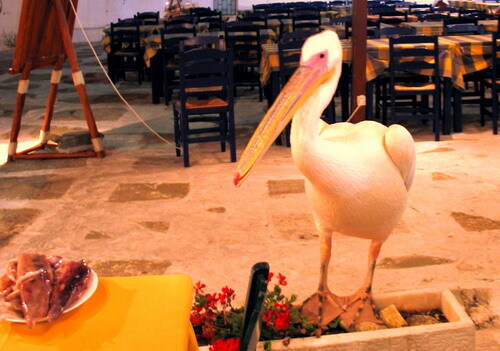 Mykonos is famous for its amygdalota or almond sweets and its almond cordial or soumada. Louza: As delicious as the island's sausages, louza is a cured meat made from lean pork with a little fat. It is air cured in winter and sun cured in summer with salt, pepper, and local herbs such as throupi. Once cured, it is preserved in the freezer to retain its moisture. Louza is served as an appetizers in thin slices which are a deep red. A smaller louza made from tenderloin is known as bouboulo. Louza is similar to the Italian lonza and the Cypriot lountza. Kopanisti: A very sharp creamy cheese that goes well with ouzo and other Greek spirits, served on bread, or according to local practice on dampened barley rusks with chopped tomatoes and cucumber. It's sometimes blended with butter or other white cheeses to soften its flavor and always preserved in the refrigerator. Kopanisti is the result of controlled and repeated fermentation according to traditional cheese making methods. It's made using sheep's and goat's milk which is aged then stored in a clay jar. Similar methods are used to make cheeses on other islands in the Cyclades, although the Mykonos cheese is the sharpest. In mythology, the Giants felled by Heracles in the Gigantomachy are buried under Mykonos and the other isles in the archipelagos. The island's name seems to derive from the ancient for either mound of rocks or rocky land. A later myth links the island to the hero Mykonos, son of King Anios of Delos. The island was first settled by the Carians and the Phoenicians, but it's the Ionians who were dominant around 1000 B.C. Ancient sources refer to two cities on the island, mention it as a place where Daetes and Artaphernes landed, and describe it as a rather poor island. Deities worshipped on Mykonos were mainly Dionysus, Demeter, Zeus, Apollo, Poseidon, and Heracles. The island passed under Roman rule, then under Byzantine dominion. It was during their rule, in the seventh century, when defensive fortifications were built to guard against raids by Arab pirates. After the Fourth Crusade, in 1204, the island was ceded to Andreas and Ieremias Gyzis. In 1292 the island was pillaged by the Catalans and effectively left to Venetian control who, in turn, administered it as part of Tinos. While under Venetian rule, the island is sacked by Barbarossa, an admiral of Suleiman the Magnificent. Passing subsequently under Ottoman rule, it is governed by the chief of the Ottoman fleet, the Capudan Pasha, and virtually self-administered as its Venetian and Turkish administrators did not which to clash. As a rule, the island's population in modern times fluctuated between 2,000 and 5,000, but swelled in the late 18th century and early 19th century by migrants from Crete as well as Naxos, Folegandros, Sikinos, and Kimolos fleeing epidemics or conflicts on their respective islands. Mykonos was an important resupply station for foreign merchant ships. The island's inhabitants gradually turned to maritime activities and commerce, having earlier tried their hand at piracy. During the 1821 independence revolt, islanders, led by Manto Mavrogenous-daughter or a powerful aristocratic family who had been raised in Trieste where she had been exposed to the Enlightenment and its ideas-repel an attack by the Turkish fleet and take part in the independence war. With the establishment of the modern Greek state, Mykonos emerged with a urban dynamic and class which cultivated its ties to southern Russia, Italy, France, Alexandria, Asia Minor, Constantinople, and the emerging center on Syros. The prevalence of steam engines near the end of the 19th century and the opening of the Corinth Canal in 1904 weakened Mykonos and many islanders migrated, many abroad-to Russia before the first world war and to the United States afterwards-or to large urban centers within Greece, such as Athens and Piraeus. Excavations begun in 1873 on Delos by the French Archaeological School established the area in the consciousness of the global elite which had the ability and desire to travel to Greece. From the 1930s onwards, celebrities began visiting the island and discovering, alongside the archaeological treasures of Delos, the joys offered by Mykonos. After the second world war, the island's tourism boomed and today it ranks among the world's top destinations. The sacred island of the ancient Greeks, Delos, in mythology, was raised from the Aegean surf by the sea-god Poseidon to offer shelter to Leto who was pregnant with Apollo and Artemis and being persecuted by Hera. Delos is remarkable for its preserves, in quite good condition, one of the most impressive organized ancient settlements. First inhabited in the third millennium B.C., most likely by the Carians, the island by the tenth century B.C. had emerged as a religious center and seat of the Great Amphictyony. In the late sixth century B.C., the island was under Athenian rule. In 540 B.C. Peisistratus orders the first "cleansing" of the island, while during the second, in 426 B.C., the remains of all the dead of Delos were transferred to neighboring Rineia; births and deaths on the island are banned from this point forward to preserve the sanctity of Apollo's temple. With the arrival of the Macedonians in 315 B.C., the island attains independence and the ability to develop commercially. Later, the Romans' presence attracted the Egyptians, Syrians, and Italians, spurring the island's growth even more; in 88 B.C., during the raids by Mithridates wars, the island suffers two devastating attacks that push it into decline and lead to its eventual abandonment in the sixth century B.C. Excavations on the island were begun in 1873 by the French Archaeological School, which brought to light the extensive ruins of this once-glittering center. The Delos Archaeological Museum is one of the most important archaeological sites in Greece. Delos and Rineia are protected by the Ministry of Culture and anchorage or overnight stays are not allowed without authorization. Several small yet interesting monuments are scattered south of Hora in areas that until recently were farm land. At Drafaki (Paspari) there are number of old but well-preserved chapels. At Vrysi, a Mycenaean tholos tomb-an unusual find for the Cyclades-was uncovered a few years ago, yielding interesting funds that attest to the island's relations with mainland Mycenaean culture. 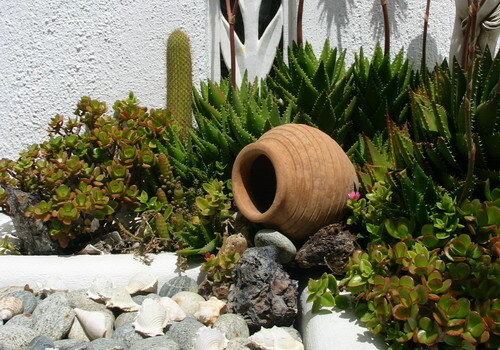 In the same area, one can see wonderful dovecotes in old gardens. Throughout the countryside, ruins of a ancient square or round towers are visible, presumably remnants of some ancient fortification system. The tower at Lino has a 10-meter diameter, while the tower at Portes, overlooking Platis Yialos, has a smaller diameter of just 3.5 meters but its impressive threshold is preserved. Several ancient wells are also still in use, among them Yiannaros's well, an underground cistern built of granite blocks with a stepped aqueduct. The Pouados is framed by steps for easy access and is located below the rim of the Tourlou-Korfos road at Tagou. This picturesque quarter with its brightly colored balconies and wood boudia seems to hover over the sea between Kastro and Skarpas. It's an excellent spot for enjoying one of the most beautiful sunsets in Greece. Paraportiania is a distinctive architectural compound that is the result of human creation and the forces of time and nature. Paraportiani's name derives from its location next to the northwestern side entrance, or paraporti, of the island's medieval walls. It's actually a two-story compound of five churches-four on the ground floor and a fifth built over them. It's the one on top that is actually Panayia Paraportiani, and was built between the 16th and 17th centuries. Thanks to the compound's unique architecture, it is recognized as an important monument not just on Mykonos but throughout the Aegean. These churches are just some of Hora's most important post-Byzantine churches, each boasting interesting icons and carefully crafted iconostasis. The large number of votives seen in most churches are part of the locals' custom of interring their ancestors' remains in church walls. Traces of an Early Cycladic acropolis are visible at the twin cove of Divounia-Tarsanis at Kalafatis, southeast of Ano Mera. 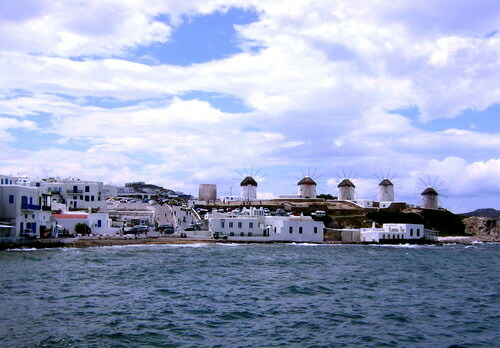 A row of seven windmills - of the original ten - rises on a low ridge south of Hora, between picturesque Alefkantra and the Niohori, looking out to sea and creating the image most visitors associate with Mykonos. Prehistoric ruins have been identified around the island, for example at Panormos, the most important being the Neolithic settlement at Ftelia. The same site has been associated in archaic times with the grave of Aias of Locris, a hero of the Trojan war who was worshipped on Mykonos. Founded in 1542 on the site of an older church dedicated to the Presentation of the Virgin. From 1757 to 1767, the monastery, which is dedicated to the Dormition of the Virgin, was renovated by the Monk Ignatios Basoula to its present form. The triple-apsed church is noted for its iconostasis, carved from wood in the Baroque style, its throne, and its late-18th century altar-all of which tradition holds were crafted in Florence. Inside there are also icons by Ioannis of Corfu. This 18th-century convent is a typical example of Cycladic monastic architecture. Located north of Ano Mera, it is named after the neighboring hill-Palaiokastro-that is crowned by a medieval castle, which was subsequently renovated by the Gyzis brothers. Nearby sights include the church of Ayios Vlassis and a large dovecote as well as a prehistoric grave comprised of a three-meter-high granite boulder. Most of the library's 10,000 - volume - strong collection is from the library of Alexandros Meletopoulos. It includes a collection of photographs, 18th- and 19th-century documents, etchings and other items. The library is located in the Ayia Kyriaki quarter of Hora and is housed in the 18th-century Kambanis mansion. Located on Alefkantra square, the church is marked by the Bourbon shield on the faade. It was built during the reign of Louis XIV. Two more noteworthy examples of church architecture are Ayios Pandeleimonas at Marathi, which is typical of 17th-century religious architecture with fine icons and murals, and the late-17th-century Ayios Yeoryios at the Ampelokipos district of Ano Mera. Three wells located at Tria Pigadia in Hora which supplied Hora with water from the 18th century through the Fifties. The elegant two-story building with the clay-tile roof was built in 1780 during the Orlof uprising and served as the headquarters of the Russian consul general. The building subsequently passed into the hands of the local self-governing authority and today houses the Town Hall and its services. The adjacent building, the imposing Mavros mansion, was the island's first public school. It was built in 1859 during the reign of King Othon (Otto) to designs by the Bavarian engineer Weiller. Mykonos's most valuable tourist asset is its beaches. The island, and especially the southern coast, features an impressive number of beaches-some of the finest in the Aegean.Access is by road and, in summer, also by fishing boat or water taxi. Megali Ammos: the best beach close to Hora. Ornos: Sheltered beach south of Korfos with regular transportation and a good number of hotels and restaurants. The beach is a small fishing harbor with good anchorage for leisure craft. There is a diving school. It is the first of the beaches on the southern coast. Psarou: Pretty, cosmopolitan organized beach with water sports, including a diving school. 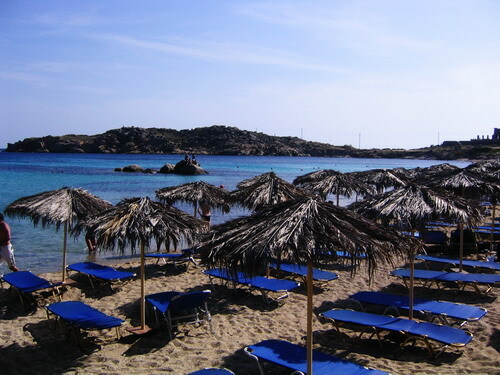 Platis Yialos: The island's most popular beach, with a good sand coast, hotels, restaurants, and regular transportation. It is the terminus for water transport to the southern beaches at Paraga, Kalamopodi, Plintri, Agrari, and Elia. Paraga: Small, pretty beach with a nice landscape. To the south, the beach of Ayia Anna hosts one of the island's two organized camping grounds. Paradise (Kalamopodi): Pretty and popular beach which first gained international fame thanks to the hippies. There's organized camping and water sports. Super Paradise (Plintri): The island's most famous beach, it's world-renowned for its beach parties. Popular among the young and hip, it's also been a destination for VIPs since the Fifties and celebrity-spotting continues to date, with reason. The beach also has a reputation for attracting eccentrics and eccentric behavior. Agrari: Another pretty beach, slightly more isolated for swimmers who shun crowds. Ayia Anna-Kalafatis: Two fine beaches with broad sand shores and clear waters separated by the Divounta peninsula with its fishing harbor. Both offer a pretty landscape, amenities that include a diving and surfing school, and good transportation. Panormos-Ayios Sostis: Unique beaches on the island's northern coast in the Panormos bay, ideal for surfing. Elia: Pretty, expansive, and popular. Elia is the last stop on the water transport route from Platis Yialos. Tourlos-Ayios Stefanos: Good beaches north of Hora. The entire area has is developed and attracts a large number of holidaymakers. Korfos: A good beach for surfers as it has a northern orientation. 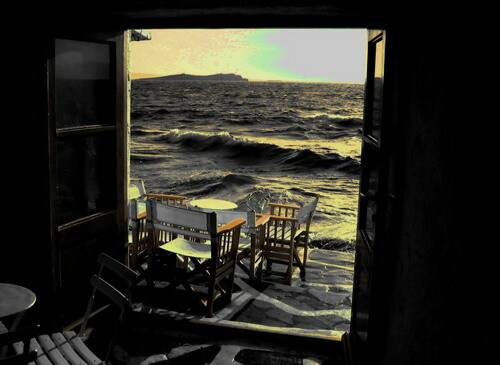 Ayios Ioannis: Cosmopolitan, somewhat western beach with a view towards Delos. 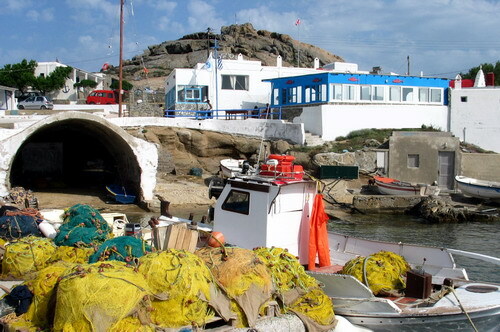 Lyia: The furthest of the southern beaches, boasts a number of fish tavernas. Ftelia: Popular among surfers thanks to its northern orientation. Tradition has been weakened as a result of development, yet a number of customs survive. The island's folklore element is most evident during religious feasts to which many customs and traditions are linked. On New Year's Day, locals put "best foot forward" for luck as they visit hopes to wish good fortune, while families cut and share the traditional pitta in which a coin has been baked; the person whose piece has the coin is said to be blessed with good luck for the coming year. Epiphany is observed with flair around the island as on the eve of the holiday priests go door to door to bless each home. This is followed by church services, after which locals meet at the harbor. There, a cross is tossed into the water and male bathers vie to retrieve it. Apokries or carnival is a time of revelry. Masqueraders roam the streets, amusing onlookers with their costumes and antics. This is followed by Kathara Deftera or Clean Monday, the first day of Lent. In the days leading up to Easter, locals spruce up their houses, applying whitewash and baking breads in the shapes of human figures, or Lazarakia. Holy Week is observed with devotion. The Epitaphios is led in candlelit procession on Good Friday, while the observances culminate at midnight on Saturday with the resurrection service. Starting early in the day on Easter Sunday, locals eat and celebrate around the island, congregating in the main square in the afternoon to burn Judas in effigy. Most religious feasts are observed with a paniyiri, a religious and folk festival.